WINSON GREEN ROAD 22/07/2018 Cafe opposite Winson Green Prison Gates . I wonder if any body has any recollections of the cafe that was opposite Winson Green Prison's original gates in the 50's? It was originally one of many cafes owned by the Jelf family but my grandfather George Quiney bought it off him sometime after the war and ran it with my Grandmother Alice. Top left. Is Cliver Roberts, holding our family pet 'Judy', taken in the back yard of my family home at 204 Winson Green Road. Top middle. My friends Roger and Carl Shutt taken in Somerfield Park. Top right. My cousin Jimmy Stait (the tall boy) with my friends Roger and Carl Shutt. Again, Somerfield Park. Photo Bottom left- Top left in the group is Roger Shutt. Top right is Jimmy Stait. Bottom left is me Terry Jordan. Bottom right is a friend Johnny Jones. Taken in Somerfield Park. Bottom Middle These are Clive Roberts parents Ken and May Roberts who were the publicans of The Acorn Pub. Bottom right- Clive Roberts taken in the grounds of The Acorn Pub -- Winson Green Road. I have only recently discovered your web site and have spent a very enjoyable few days reviving many memories. I moved to Winson Green in 1948 with my parents to live in Prison Officers quarters right next to the prison gates. I only lived in Winson Green for a few years but I attended Foundary Road School until 1953. Being the only girl in my year who moved on to King Edward VIth School I lost touch with many of my local friends and I have lived in North Wales for the past 55 years. In Wales I graduated from Bangor University and had a career in education, culminating as a dyslexia consultant working in a local college training teachers in this field. Married with two adult daughters and teenage grandchildren I no longer have any links with Birmingham so it has been good to relive many old experiences through your site. But we were a local family for several generations and my paternal grandfather and his siblings attended Foundary Road School in the last years of the 19thC! I wonder if there are any records from this early date. Stories from school and playing in Black patch park brought back many memories, I recognise many of the names on your website spanning the years I lived locally including Lynda Garrett with whom I had contact some years ago. I kept in touch with one particular friend,Joyce Bamfield, until our late teens when her family moved to the Coventry area and I think Joyce joined the Wrens. But it is the photographs that have raised most memories particularly the one of Clive Roach and his dancing partner probably taken at Christmas time in 1951 or 1952. Yes Clive’s partner, un-named on your site, is me. i even have an almost identical print showing me in the same costume also in the school hall. I remember my Mum making the costume from crepe paper but just cannot remember the occasion. At that time photographs were not very numerous so it had been fun inviting my family to look for any familiar faces. it would be great to hear from Clive or from any other school mates who may remember me. I have just been looking through your site, what a marvellous idea - its great to see places and names from my past. I was born in 3/228 Winson Green Road and lived there with my parents and three brothers until we moved to Northfield in 1959. Our yard was opposite the prison and consisted of two rows of 9 houses behind a row of shops, each house had a front garden and the houses shared outside loos (2 or 3 families shared a toilet) and brewhouses where the laundry was done. Each house had a kitchen, a front room, two bedrooms and a cellar. Down our yard also lived my dads 3 brothers (they were the 4 Bradshaw brothers and they had lived there since early childhood circa 1910 onwards ) then as they married and had families moved into other houses in the yard. It was great growing up and having the family so close so many cousins. Some of the family names I remember that also lived down our yard are Loveridge, Hurd, Prosser, Pearce, Woodcock, Patch or Pash. The shops that I remember are :- next to the church was Mrs Hyde the sweet shop (I used to do shopping for her and she sometimes paid me sixpence) next to her shop was Clutterbucks or something like that the grocery shop, there was a drapers shop, a paper shop - not sure if that was called wigleys , a shoe shop and an outdoor (where you could buy beer in your own jug) on the corner of Foundry road. I remember there being a barbers on Foundry road called smiths (I believe it was there for many years) My 3 brothers and I went to Boulton road primary school, my cousins went to foundry road. I attended Sunday school at the Elim church in Handsworth New Road and the Girls Life Brigade at the Congregational Church opposite the prison. My family and I lived at 28 Winson Green Road from the 1950s to when the houses were compulsory purchased in the 70s? My parent still live around that area – Paxton Road, Hockley. I live in Pershore now, and it breaks my heart sometimes when I go back to the area and see how things have changed – some for the good some for the not so good. I regret not taking photographs of the area before I left, but I was young back then with other things on my mind. I was wondering how to write on the ‘comments’ section of your page as I wonder if anyone has any photos of the ‘top end’ of Winson Geen Rd, by Summerfield School. By the way, this is a treasured site for me, as the photos and comments bring to life, the memories of my childhood in that area. Thanks Ted, for a truly wonderful experience. I doubt if anyone remembers me Roger Shutt. I lived at the back of the post office in Winson Green Road, facing the prison, in my early teens in the 50's until 1962 when my family moved to Hereford. I had a young brother caled Carl.We lived next door to Audrey Baylis , and my mates were Terry Jordan, Jimmy State, Johny Jones, Colin Perks. I had a part time Saturday job at Banister and Thatcher Chemist, before leaving school and working for Boots on Cape Hill. My family moved up to Winson Green Road in 1961. We were living with my Mom and sister in a couple of spare rooms at 371 Lodge Road. At that time I was working as a molder for a Bakelite molding factory on the corner of Lodge Road (opposite the Post Office) Called Harris's. One of the molders I worked with told me of a house that was going rent free on the Winson Green Road. A certain Dr.Docker was looking for a part-time receptionist and a caretaker. We applied, were interviewed and got the positions and the house. Its number was 134. Mr & Mrs Eric Taylor & baby daughter Deborah were the new kids on the block. It was like a dream come true for us. We now had our own house complete with bathroom, indoor and outdoor toilets, plenty of spare rooms and a telephone, it was heaven. There were two doctors on duty; Dr.Docker and Dr.Johnson. My wife Sheila was a part time receptionist as she covered for the other live in receptionist who actually lived on the Doctor's premises at No. 132. The Winson Green Road was a real thoroughfare with every type of shop you could wish for. Newsagents, butchers, barbers, cycle shop, grocers, betting shop, toy shop, sweet shop and a cafe on the corner of Bryant Street. On the corner was Syd Clegg the Potato King next to a butchers shop then a newsagents owned by Mister Irwin. The Winson Green cinema lay across from Cleggs. Our view from the front bedroom was not a pretty one. Over the rode from us was a public urinal (The busdrivers and drunks used this quite a lot) Then we could see the infamous Winson Green prison plus the back view of All Saints asylum all running alongside the old canal, which was great for walking the dog..
On the corner directly opposite our house was the public house "The Smith's Arms" and a little further up was the pet shop called "The Tropicana" owned by an enormous fat man in a beret and a small goatee. He always sat in a chair by the front door. I don't ever remember seeing him standing up to serve anyone. His daughter who was on the large side did the serving if you popped in to buy some fish food etc. In 1962 our son Scott was born on the premises which completed our family. We saw and had plenty of drama on "The Green" and often had a front row seat from our bedroom window as the drama's unfolded. The National Front Party held a protest parade which started and ended dead opposite our house on a piece of what looked like waste ground although there was a sub station set upon it. Police galore (some on horseback) gathered outside keeping the two warring parties apart, whilst what seemed the entire population of Pakistan armed with wooden railings gathered at the other side of Winson Green prison. It ended up as a free for all which would have turned real nasty if it had not been for the police intervention. Then we had a bomb scare and the bomb disposal squad were called in to tackle a mysterious parcel that had been left in the telephone box, again more or less opposite our front door. The surrounding houses and shops were evacuated by the army and police. They assumed the four houses where we lived were all unoccupied (three of them were empty) and they somehow they missed us. At that time there was a lot of empty properties as "The Green" was going through a face lift.We watched from the bedroom window as the bomb disposal squad sent what looked like a kids toy army tank creeping slowly along the pavement up to the telephone box. Luckily for us it turned out to be a false alarm. Some hoaxer had put a small battery with a couple of red wires wrapped in brown paper hanging from it inside the telephone box. We thought afterwards how stupid we had been not to have taken cover. Sometimes we never learn. Then came the highlight of our life on "The Green"
"The Great Escape from Winson Green Prison"
In the middle of the night we were awakened by flashing lights and police loudspeakers. The Police were barking orders over the speakers and all hell was going on. Once again our front bedroom window became our theatre seats to what was going on. As it was dark we couldn't really make out what was up. People were on the street talking to the Coppers. Lots of sirens, excited pointing and waving of arms and that was about it. The television people came and interviewed some witnesses. It was a bit of a comedy to be honest. Apparently the woman across the road had amazingly seen it all as she just happened to be taking her washing in at the time of the escape. She had seen a mysterious woman who had asked her what time it was and some other details that were of interest. All this was filmed for Central television. On the evening news it was all there. The family who had seen the goings on were now fearing for their lives. They had been filmed on telly standing outside their terraced house giving their eye witness statements. 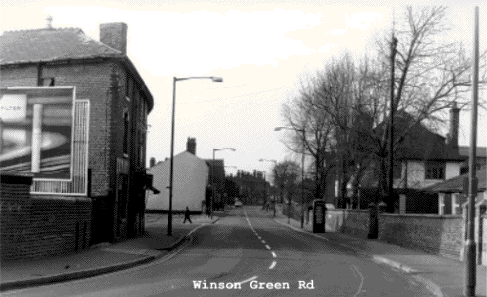 The large road sign saying "Winson Green Road" was situated under their front room window for all the World to see. Fearing reprisals from the gang members they asked to be relocated. The only thing that was relocated unfortunately was the large roadsign. It was taken down by the council and relocated about three doors up from them. Yes we certainly saw life up on the "Old Green" and we wouldn't have missed it for anything. Since then the four house where we lived have all been knocked down and a great facelift has been done to the area but it will always hold fond memories for our family. There were 5 butchers shops on Winson Green Road. All of us making a good living this is me waiting for customers after an early start putting my prize window on. DOES ANYONE REMEMBER In 1971 I was paying £7-50p for 2 N.Z. Lambs from Myttons on the Flat who supplied the meat for my shop on Winson Green Road. You can't get a leg of lamb today for anything like that price. So how much was I charging my customers for a leg of lamb in 1971. Can anyone remember ?. A 1971 Invoice for meat to Keith Wassall's Butchers shop on Winson Green Road. I've recently read John Gillon's little piece on the best barber in Winson Green (see Heath Street 03/04/08). This reminds me of another well-known hairdresser in Winson Green Road. His name was John Burnett, known to the local youth as Jackie. He played the drums in a local dance band and his son, again Jackie, followed in his footsteps as a well-known Birmingham jazz trumpeter and bandleader, the band being known as the Jazz Bandits. Sadly, John Junior passed away a few years ago, but left his mark on the Birmingham jazz scene. I am looking for my half brother, he was born between 45 and 50 years ago whom I believe his mother lived near Winson Geen Prison her name was Eileen Hayward and had just finished school. I believe Eileen was sent to Dr Bernardos as she was young and her parents did not approve of my father. My father is originally from Jamaica and was over here from the age of 14. I believe Eileen has married but I do not know her married name. I think Eileen may have named my brother Roy. If anyone knows anything off Eileen or Roy I would be so grateful for any information. While I am here I was also interested to find out about friends of my fathers whom I believe used the names Mitt and Ant there was also another friend whom my dad calls the sailor boy. I made friends with a new lad who had started at our school, in fact he had moved to Birmingham from another part of the country with his family. I thought I was smart and knew a thing or two but soon found out I was out of his league. I was about thirteen years and we would go to a cafe in Winson Green Road sit there with a bottle of Coke or a cup of frothy coffee and think we were a couple of hard nuts. It was a little further down than the Smiths Arms on the opposite side of the road and I think it was called the Jesmond Cafe. Why I remember the pub was we use to buy cans of beer there Double Diamond. Yes only thirteen years old but they was not so strict in those days it was the fifties. Thanks for your brilliant site. I used to work in the area and it's fascinating to read/see all this information. I was wondering if you have any photos of the pet shop which used to be at the top of Winson Green Road? Then there was the lovely Mrs Hyde at the wholesale sweet shop at the end of the block, wonderful lady, would make up a mixed bag of sweets for me from the big jars lining the shelves. She gave me six Mars bars once for my birthday - what a treat! My nan worked, I think, as a dinner lady at Foundry Road School, I can certainly remember being taken there during mealtimes. My parents married at Bishop Latimers, my nan lived in Beeton Road, and I was christened there. I think that was where I went to the Coronation Party (dressed as a television, with of course a picture of the Queen). I spent most weekends and most of the school holidays with my grandparents, and days and days in the Black Patch Park, and every Sunday morning, before I went home, I would walk around the park with my grandad and his dog. Happy happy days. And Scribbons Bakery, my aunt and uncle both worked there and I got a kitten from there, (they kept them because of the mice), pure white with long hair, and covered with dough when I got it. My dad lived in James Turner Street and soon after he returned from the war he bumped into my mum, she apparently went home that day and said 'I have just seen Doug Preator, I will marry him.' Six months later, she did. I am sure there is much more - what a wonderful site. WINSON GREEN ROAD 16/09/06 I lived at 10/226 Winson Green Road from the late 60s/early 70s. I was only a child and I had the best childhood and good stories about what my young eyes saw, and my ears heard at the time. 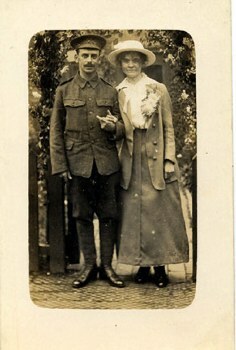 WEDDING POST CARD DOES ANYONE KNOW WHO THE COUPLE WERE??? (post card thanks to mac joseph for sending it to us. We are trying to trace our relatives who we believe lived in Winson Green Road. Blackwell - Dolly Emily and Ernest and Arthur. Arthur married Minnie Jones who we believe worked at the picture house and we think Ernest worked there as a projectionist. Arthur was in the Grenadier Guards during the 2 World war. I'm 70 and was born at 15 Winson Green Road, where my grandparents ran a Faggots and Peas Cookshop. The view of Dudley Rd and Icknield Port Rd junction brought a lot back. My father was a volunteer AFS fireman based on the small garage just inside Icknield Port Rd by the tram terminus (by 'Uncle McKies' pawn shop). Sadly all my family photos have been destroyed in a malicious act. I would like to contact Donald Stringer of 15 Winson Green Rd as my dad Horace Mills kept the barbers shop at no.13. Donald's dad had a barbers shop years before in either Foundry Road, or was it Foundry Lane. My Mom was a warder at the prison mainly on nights for many years, to pay for my education at George Dixons. My best friend was Graham Ball who lived in either Peel St. or Carlisle St. The years in question 1942- 1949 circ. We lived at 1/5 Winson Green Rd from1964-1971, me and my brother Maurice went to Dudley Rd school. Mr Cocking was the headmaster and some of my teachers were Ms. Amott, Mr.Lloyd and Mr.Jones. 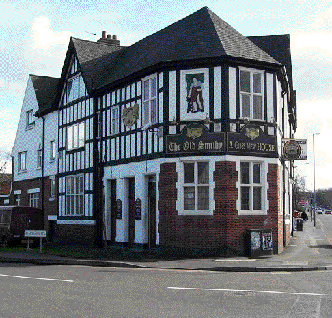 Photograph of THE SMITHS ARMS taken March 2004 thanks go to Alan Butler. And thanks to Mac Joseph for the image of the coin Any Idea's what this coin was used for????? WINSON GREEN ROAD (Smiths Arms) 19/03/04 At the "Smiths Arms" during the late 1950's and the 60's and 70's my parents were the barman and barmaid they were Ralph and Kath Mallaband the licensee at the start of there service behind the bar was Mr Jack Durant I am sure that a few people will remember them as they worked at the pub for 25yrs or more. Sadly dad is no longer with us but mom is still going strong and is now in her 80's would love to hear from anyone who remembers them or me. Great site Ted keep up the good work. In the photo on the left above there is a space (Wellington Street) then the side of a building that is painted white. At this point stood the picture house we used to call it "The Green" the posh name was the"Winson Green Picture Palace". This is what the picture house used to look like Thanks to Anita Cunniffe nee Gregory who used to live in Benson Road we now have an image of the "Winson Green Picture Palace" Anita also told us it opened in 1914 seated 1400 people and closed its doors for good on Saturday 21st March 1959 we have no idea when it was demolished. Last films shown were "Sea of Sand"and "Suspended Alibi"